You must be wondering.. What am I doing here? Recently, these powder masks that turn into rubber modelling masks have been on the rise. I've found it quite intriguing and couldn't wait to get my hands on it. Little did I realise, my beautician has been using this kinda mask on me during facials.. XD Which made me think that this would be so cool to try at home too, since they work so well in the salon! A simple intro into the brand Ettang which was launched in Malaysia about a year ago and can be found exclusively in Sasa Malaysia stores. "Ettang" refers to the "the earth we breathe and live on" meaning that all cosmetics created are healthy and uses only excellent raw materials of the Earth. Ettang is a naturalism cosmetics brand that insists on not using harmful chemicals in their products. Admittedly, I received these quite awhile ago and only now do I have the time to write about my experience. I do agree with Ettang on their skin leader philosophies. They strive to provide high class & high quality products used in aesthetic salons to be enjoyed right at home, making it more economical and convenient. Using only the best raw material mixing method, these masks will make your skin feel instantly moisturised after application without causing irritation. Due to the high temperature and humidity in Malaysia coupled with dry air in an air-conditioned room and stress or environmental pollutions, our skin tends to become dull and uneven. This mask is perfect for those who need a special skin-whitening product that is not only natural, but also professional. Each Ettang Modelling Take-Out Cup Pack also comes in these lightweight plastic cups that are convenient to carry around and easy to use anywhere, even when travelling! What's more, all of their products contain aroma oil to calm the body and mind, each kind targeted for different consumer class ranging from teens to the 50s. I mean, who could resist the cute design of this mask pack? It can be quite confusing to some people as it does not state that this is a mask and it has only Korean words on the front though. There are 8 flavours in this range and all the ingredients are naturally-derived from plants, making it Muslim-friendly. 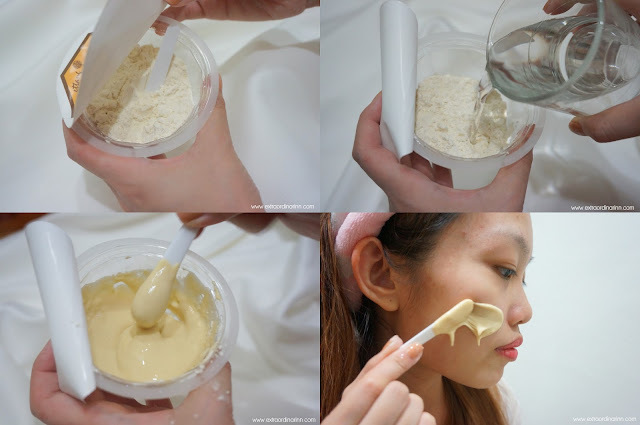 At the same time, K-pop lovers should love this mask as it's one of the secrets to how artistes get their smooth and fine skin! Among the 8 flavours of mask (Yoghurt, Acerola, Propolis, Chlorella, Charcoal, Collagen, Peppermint & Paper Mulberry), I got this The Peppermint Modelling Take-Out Cup Pack as it can provide rich moisturisation and keratin care to my combination-dry skin. This premium product claims to relieve stressed skin as it contains tea tree and mint substance, which makes it great for acne prevention as well. There are some small dark green bits within the light green powder which are actually real tea tree bits! The mask actually turns into a light green paste once mixed with water. These ingredients work together to soothe and condition the skin for a refreshing feeling after use. This Propolis Modelling Take-Out Cup Pack is made with natural propolis which is an enzyme that has been mixed with the saliva and sap of the bee. Now, I know that sounds quite disgusting, but it's actually not! Propolis is a popular ingredient in skincare products as it contains many kinds of flavonoid and nutritions to nourish and protect the skin from harmful elements. For people with sensitive skin like me, this is great as it not only reduces sensitivity but moisturises and brightens the skin at the same time. Now for the fun part. Preparing this mask is easy, but can get messy on your first try. Since the mask is a powder, be careful not to open it under a fan as it will fly around. The spatula wasn't provided, I used my own one to mix the mask. First, you have to add water to about half the container size. Do note that one 'serving' can only be used once and cannot be kept once you tear off the plastic layer on top. Mix the mixture well until it becomes a sticky paste, but make sure that it is still watery enough to apply on the face. FYI, the golden ratio of powder to water is about 1:3 and for this pack, about 54ml of water would be ideal. You can also adjust the viscosity by removing half of the powder in another container and adding water first before slowly adding in the powder to get your desired consistency. After that, apply the sticky modelling pack on the face according to the face line, which is in an outward motion. It is advised to apply in the order of cheek, chin, nose bridge and forehead. My biggest tip would be to make sure you get the right consistency as the mask dries fast so you need to apply very rapidly onto the face before it dries up! Some skill is definitely needed for this. This is how the mask should look like once it's fully applied. It is yellow in colour because of the ingredients (propolis) and each rubber mask has a different colour depending on its flavour. I couldn't really capture the exact consistency when it was freshly applied as it dries so rapidly, you can even see some dried powder marks around the corner of my eyes already at this point! After 15-20 minutes, it's time to peel it off! The mask will harden and become rubber-like. It feels quite cool on the face and you can actually feel the face tightening. It's really fun and easy to remove too! For any remaining residue, it is advised to use a cotton soaked in toner to clean up. After that, apply your ampoule, essence and cream for a moisturised and smooth face! 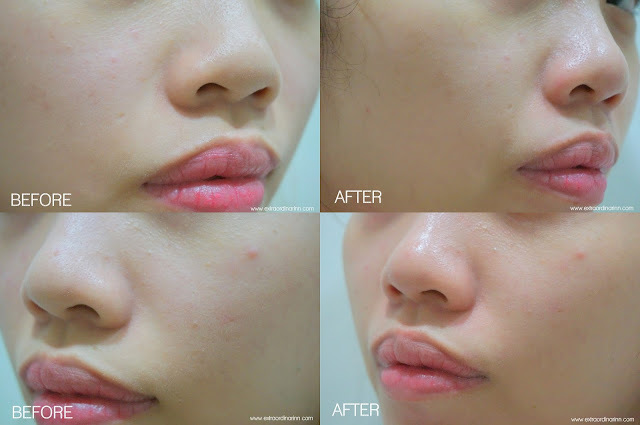 - Messy to prepare and apply! For more information on this and other products, do check out Sasa Malaysia stores nationwide or their social media for the latest updates!